As most of you know, I love a good mason jars. Oh wait, there is never not a good mason jar, so maybe I'm just in love with them all. They come in a plethora of sizes, can be used for a gazillion purposes, and make everything look homier, just because of their rusticity. 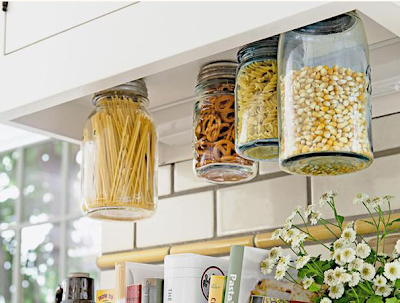 Recently, I cam across this website that had a DIY for hanging mason jars under cabinets which maximizes space AND looks adorable. I want to do this to all my cabinets and use them for all the dry food I have sitting on my counter. Popcorn? Check. Quinoa? Check. Chocolate covered pretzels with peanut butter? Check and check. You could even use this for a garage/work space and put loose screws, bolts, ribbons, confetti etc. in them to organize that space. If there is a run on mason jars on the UES, you know who went out and bought them all: this girl.